Making good life choices is hard. Making good life choices when you’re neurodivergent is damn hard. Perhaps the most relatable and engaging such struggle I’ve read is that of Miles Vorkosigan, from Lois McMaster Bujold’s Vorkosigan Saga. Miles and his “excellent life choices” entertain, astound, and horrify me even as they dig at something deep inside my bipolar, ADHD brain. Miles Vorkosigan inevitably comes up in conversations about disabled characters in science fiction, but not because of his debatable life choices. Miles was born with brittle bones, stunted growth, and a host of other physiological complications due to his mother Cordelia’s exposure to a toxin while pregnant, and he enters young adulthood as a visibly disabled person in Barrayar’s militaristic, mutation-phobic society. However, his physical differences are only one facet of his life as a person with disabilities: he is also neurodivergent, displaying characteristics that the text calls “manic-depressive” and “hyperactive.” Many fans believe that Miles, like me, has bipolar disorder and ADHD, and these departures from the norm increasingly drive his characterization as Miles matures, adapts, and changes his body. As the rare speculative fiction character who is both deeply privileged and markedly disabled, Miles’s ability to change his body is an important part of his narrative. Miles is a member of his society’s hereditary nobility, and over the course of his life, he is able to have numerous surgeries and other medical treatments to replace his brittle bones with synthetics, address injuries up to and including biological death, and ameliorate his many idiosyncratic reactions to medications and other substances. 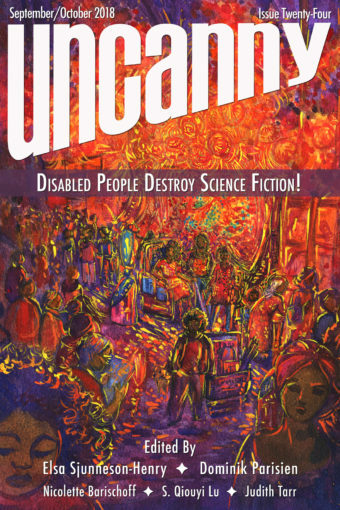 This is significant in a genre that, by trope and tradition, envisions disability in terms of choice: absent a lack of resources, no one would choose to be disabled when advanced technology or supernatural means can “cure” or “fix” them. However many resources Miles has, he never ceases being disabled; his world, life, and narrative continue to be shaped by his conditions. He is never entirely “cured,” whether by Miles’s own choice or by the limitations Bujold has set on the text. Consequently, Miles’s depiction is in constant conversation with what his society—and the audience—considers normal; what about Miles can be changed, and what about Miles should be changed. Miles and Cordelia both make an active project of trying to address and change Barrayaran social norms, and part of Miles’s journey is in changing the way he thinks about people’s perception of him. Initially sensitive about his appearance and taking pains to make sure observers know it’s not due to mutation, Miles comes to see the value in forging a path for anyone who looks different, no matter the reason. But that very preoccupation with appearance is what I want to talk about. Miles spends so much more time and energy working to normalize the way he looks than normalizing the way he thinks that he can come off as downright anosognosic when it comes to his own neurodivergence. It is only halfway through the series, when Miles makes a disastrous decision while neither manic nor depressed, that he truly grapples with how he makes decisions and weighs choices. Miles is clearly meant to be seen as nonnormative, and psychological treatments are explicitly available in his world. His mother Cordelia advocates therapy in cases such as trauma but doesn’t seek to pathologize Miles’s brain or suggest any form of professional psychological treatment. Other characters also comment on Miles’s mental state(s) but eschew the idea of therapy: “You mean psychiatric? Absolutely not. Real bad idea. If the psych boys ever got hold of him, they’d never let him go. No. This is a family matter.” In other words, Miles may not be aware of his own neurodivergence, but the text explicitly is, and the way Bujold plays with Miles’s decision making is worth examining. The narrative thrust of the Vorkosigan Saga is predicated largely on Miles’s many questionable decisions, and decision making is a classic casualty of both bipolar disorder and ADHD. In sharing those conditions, I find Miles fascinating as a protagonist—as subject rather than object. Although recent works like Mishell Baker’s Borderline and Rivers Solomon’s An Unkindness of Ghosts feature neurodivergent protagonists, Miles predates them by decades. Society, and by reflection literature, has long framed neurodivergence as a problem to be solved, as a topic rather than a subjective experience. It’s unclear how intentional Bujold was in her portrayal of Miles’s psyche vis-a-vis our pathologized categorizations of conditions such as bipolar and ADHD, but she has consistently captured how those conditions affect the ability to make decisions, and the ability to live with them. Whether in a manic or depressive state, bipolar disorder can warp one’s ability to sort through priorities and consequences. Miles is a deeply strategic thinker, but his ability to prioritize is often hampered by hyperfocus. It’s generally only when the narrative gives Miles a moment to pause that he can reorient himself. Miles’s mantra is “forward momentum,” and his behaviour is often narrowly goal-oriented, both classic manic traits. When I’m in such a state, it can be supremely difficult to consider personal cost to myself and others and to not overcommit; I find Bujold’s depiction of Miles’s struggles with these issues realistic and nuanced. For a long time, I didn’t even realize I was hypomanic. I thought that was what being healthy felt like, because those were the times when I did not feel depressed. And hypomania was such a high: I felt that indefinitely precarious sort of invincible where I knew that right now, if I just kept going, I could do anything. If I didn’t stop. A moving target is hard to hit, but depression has deadly aim. Downright dirty, deathly aim. Miles’s obsession with being a moving target—for he has always known he can’t avoid being a target—speaks a language I know in my bones. Miles fears stasis, because to him stasis is death. This is emphasized when, around the midpoint of the series, Miles is killed and cryogenically frozen. It is from those ashes that the turning point novel of the series, Memory, arises, and it is there that Miles must learn an important lesson: there is a peaceful sibling of death and stagnation to be found in stillness. Eventually. Miles’s struggle with decision making starts from his first book, Warrior’s Apprentice, where Miles’s spur-of-the-moment, goal-oriented decisions spiraled into dire consequences and sleepless nights doing research and actionable tasks. I, too, have gone on productivity binges where I barely slept for a week. In the process, Miles built a second persona that could accomplish everything and contain his manic energy: Admiral Naismith, separate from Miles’s staid “real” identity as Lord Vorkosigan. However, the mechanics of Miles’s mind are not a focus of the text for the first half of the series, where Bujold prioritizes Miles’s struggles with his physical appearance and limitations. This changes as the series goes on, and is neatly encapsulated in one of Memory’s early lines: “He’d worked with impassioned concentration, overcoming all doubts as to his physical disabilities, winning his way to premier status as Barrayaran Imperial Security’s most creative galactic affairs agent.” Having carved out a space for those who look like him, Miles finds that unexplored country yet remains, and it is within himself. While most of the Vorkosigan Saga is about Miles’s choices and ever-shifting identities—student, soldier, admiral, spy, auditor, son, husband, father—Memory is the most concerned with examining his internal landscape. In the novel immediately prior to Memory, Miles, as Admiral Naismith, was killed, cryo-revived, and left with an idiosyncratic seizure disorder. In Memory, Miles makes the disastrous decision to cover up this medical condition with near-deadly consequences on a mission. He is subsequently fired, forced to abandon his covert ops identity, and must rebuild a self that can cope with his new life circumstances. The identity that he had poured all his ambitions and energy into has been forcibly cast aside, and the text chillingly frames this not just as Admiral Naismith truly having died, but as Naismith trying to get Lord Vorkosigan killed. However, Bujold frames Miles’s decision as being made in a largely euthymic state. It is premeditated and conscious, involving both forethought and plans for mitigation. These are not characteristics of mania, and Miles does not display signs of depression at this time. For me as a bipolar person, this is a wake-up call: there is no me that is free of myself. The bad habits of brain built during mania and depression can haunt me even out of those states; my identity will forever be complicated by my conditions. Like Cordelia, Bujold resists pathologizing Miles’s decision making: he can make disastrous choices even when neither manic nor depressed, and the consequences must be dealt with just the same. Bujold uses just such a choice to set up the conditions where Miles begins to question that decision-making process. For once, he can’t blame anyone or anything except himself. By situating Miles and his decisions in this context, Bujold provides a site for meditation on identity, decision making, and the brain as bridge between physical and mental. When Memory begins, Bujold carefully orients the reader to Miles’s physicality and appearance. She opens by describing Miles awakening from the disastrous mission-bungling seizure with its subjective aftereffects, mixing in descriptions of Miles’s nonnormative body. This is followed by outside and medical descriptions of the seizures, emphasizing that they do not seem to respond to standard treatments. Past this point, descriptions of Miles’s body and appearance peter off to be replaced by Miles’s subjective experiences, first of a seizure in front of his boss, then of a depressive catatonia in response to being fired. Continuing this pattern, the text increasingly concerns itself with Miles’s mental state, how he integrates his various identities, and how he brings himself not just to make good choices again, but to make choices at all. In structuring Memory this way, Bujold marks it as a transition for Miles from one career to another, from one life stage to another (Bujold’s summary of the novel is “Miles hits thirty; thirty hits back”). She also communicates that he is at a point in his life where he must turn his preoccupation from his physical differences and disabilities to his mental ones. Again, the brain serves as both symbolic and literal site of mediation. The seizure disorder is described as a “damned saboteur lurking in his head,” and Bujold cannily plants the language of introspection early in the book where Miles thinks Imperial Security, his branch of the military, may need to do some self-scrutiny over the novel’s opening mission. ImpSec does end up performing an internal investigation into the novel’s unrelated main mystery, and this forms the part of the plot that is exterior to Miles’s head. When I read Miles using that language, I cannot help but think of the tendency of my bipolar and ADHD self to self-sabotage, of my neurodivergent self’s need for internal investigation and self-reflection. Miles sabotages himself over and over, to the point of getting himself killed. It chills me to contemplate this. But Miles, unlike us, gets a chance to recover from that fatal choice and do the work of considering his choices, his identities, and how they can be reconciled into a healthy whole. Memory spends a lot of time in liminal states, with characters waiting or recovering. Or, as Miles learns over the course of the book, simply being. Liminality is a site of profound discomfort in our culture, but for me as a bipolar person, it is a state to strive for and explore: the in-between place, the shaky tipping point between one state and another. This, nurtured and contemplated, becomes that peaceful sibling: calm. One of Memory’s most crucial moments comes when Miles returns to visit some characters who were part of a pivotal time in his twenties: subjects of his whom he aided at a moment of personal disaster for them. These people and their community are much less privileged than Miles, and Miles confesses to them how he squandered the enormous opportunity he’d won by luck and effort. During a quiet moment by a lake that was once a graveyard, the woman Harra tells him that there is no hidden secret to recovering after disaster. You just go on. And on the other side, you find… yourself again. Your life. Miles’s story not only gives me hope, but makes me feel seen. Over the course of Memory, Miles is surprised to discover within himself a calm center that has lain, if not undisturbed, then at least not extinguished, not frozen out. This center, this stillness, is not one he finds easy to access, but in his journey I see a reflection of my own. As Miles begins to resolve his internal struggle, he also seeks treatment for his seizures and learns what causes them and how to manage them. He will never be cured; he must check his neurotransmitter levels daily and trigger seizures in controlled circumstances to avoid having them when stressed or when it’s been too long since the last one. In parallel, he learns to harness Admiral Naismith’s more useful qualities and discard his destructive ones. The cost and work of managing disabilities is acknowledged, and “fixes” are neither easy nor mandated. Miles does not stop having manic or depressive phases; his distractibility does not lessen. The obstacles society puts in his path decrease only marginally, and that in no small part due to his own efforts. But after the transition point of Memory, Miles begins to nurture his mental and emotional health, to harness his manias to a productivity that is not self-consuming, and to find tools to light the way out of depressions. This development is highlighted in the later novel A Civil Campaign: Miles does not cease making bad decisions, but he has learned how to prevent some and identify others much more quickly and has developed tools for recovering from mistakes. For me, this is a healthy vision of life with a disability. It is not a slow freeze or a self-immolation, but a balance of self and selves. I’ve often struggled with seeing myself as a fractured broken assemblage, but I have been slowly discovering that the secret is not to snuff out these selves. There is no me that is free of myself. The challenge is to find that central self and nurture it; to use its strengths to temper other states and selves. Making decisions is still hard, but Miles finds, if not a map, then at least a light in the darkness. 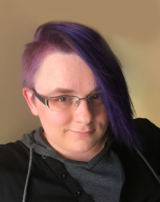 Ira Gladkova is a queer and genderqueer writer, artist, and vidder with autism, bipolar, and ADHD. They are one of the editors at the Hugo-winning blog Lady Business, where they analyze books, comics, games, movies, TV shows, and geek and fan culture from an intersectional feminist perspective. Ira has been, at various times, an internationally ranked competitive rock climber, a martial artist, a web developer, and a teacher. They live in the Washington, D.C. area with their partner, four cats, and a corgi.